This is my current list of favorites. If you ask me next week it could be different. These books kept me up at night as a child and instilled a love of scary stories in me. They might be the reason I’m so weird today. Thomas Harris’s writing gives you a since of dread that plays out through the whole novel. The Silence of the Lambs will keep you on the edge of your seat and make you leave an extra light on at night. You never know who’s lurking in the dark. Ankh-Morpork gets its first newspaper in The Truth. Follow exploits of William de Worde as he creates the first newspaper and all the issues that follows as he trys to tell the truth! I think this novel is even more funny in the age of “fake” news and misinformation. This is a masterfully written novel of newspaper satire and some truth. Disclaimer – This is part of a series but you can read them in any order. Stewart O’Nan is a magician at telling the story of working-class people. Last night at the Lobster takes place during the last night at a Red Lobster before it closes for good. If I tell you anymore I’ll will ruin the book. Just check it and discover the magic. I forgot to mention that the book is short, like 160 pages short. If you have only read the “essential” Edgar Allan Poe, you are missing out on some great stuff. I’m not saying Murders in the Rue Morgue is bad because it’s not, but you should give The Masque of the Red Death a try. Robert B. Parker was a literary staple growing up. Both my parents read all of Robert B. Parkers books. The Spenser series has become fun for the whole family. If you like old-school noir private deceives you’ll like Spenser. 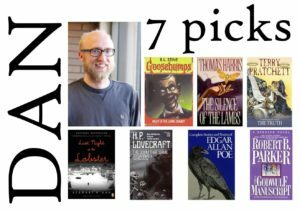 This entry was posted in Blog Post and tagged book recommendations, Book Review, Books, Daniel, Fiction, mystery, novels, Recommended Books, Staff Picks. Bookmark the permalink.